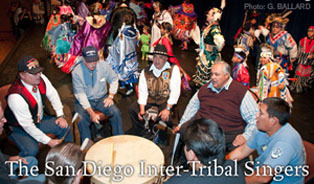 San Diego Inter-Trial singers respect and enjoy singing all forms of traditional tribal songs. Our major focus is individual performances in a small group setting. 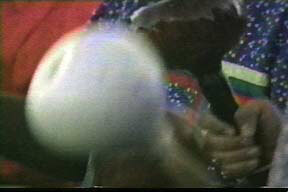 We have been invited to be the Head Drum for many events and pow wows in the past. 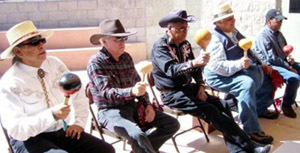 From time to time, we still enjoy sitting in with other groups and singing gourd dance or round dance songs. Our current public performance focus is to continue to accept invitations for smaller group, single morning or afternoon or specific singing role presentations: Flag or Veterans, memorial, spiritual, gourd dance or round dance songs. We attend many of the same Tribal activities as before but on an individual basis and often join in with other groups for pow wow singing. 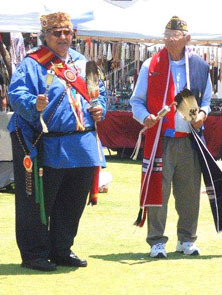 Historically American Indian dance and music has always played an important role in Plains Indian cultures. Among these Tribal traditions were summer gatherings of ceremonial and social dances. Also, in many Tribes warrior society dances were hosted and held to honor and insure the safety of their members. At the end of World War II with the return of Indian soldiers from abroad, the warrior society dances of the past century began to acquire new meaning. Additionally, returning Korea and Cold War warriors were honored at powwows or "Homecoming Dances," as they were sometimes called on the Southern Plains, which included the songs, dances and regalia of earlier traditional warrior societies. Urban powwows have continued to grow over the last sixty years; whereas 70 years ago most powwows took place on reservations, some of the biggest are now held in casino complexes, convention centers and gyms in large cities around the country. Today, the powwow is both a community gathering and cultural celebration. It is not a commercial event, nor is it purely "entertainment." It is an important spiritual and social gathering of people to celebrate American Indian traditions, dance and social customs. Also we have had the special opportunity to receive instruction in the Southern California Traditional Tipai Wildcat song style. We are honored to sing with Jon Meza Cuero, Tipai. The timeless quality of the songs and stories carry the Tribal culture from the timeless past into the yet unknown future. As such the chronological dates in many of the traditional Native American stories are fluid. Fluid almost as much as the inspiration that sparks the humanity and glow in our heart to share: thoughts, emotion, joy, sadness and historical events. This dance and these songs originated with the Kiowa tribe in the Black Hills of South Dakota in the 1700s. For a period of time, they were not presented in public but in the early 1950s there was a revival of this popular tradition.